King Cashalot is the new MicroGaming Viper progressive slot. It is a 5 reel, 9 pay line and 45-coin game. 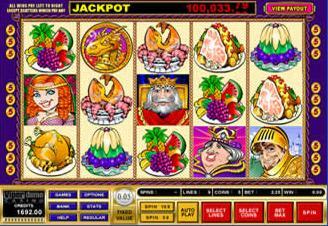 King Cashalot has scatter symbols and wild multipliers giving the player even more chances win big. It is also the first game to offer the “Pick-until-Collect” bonus game where the player chooses to take a gamble and discard his/her win and try for the bigger jackpot.. The theme is, as the name suggests Medieval and the brightly coloured artwork abounds with golden dragons and beautiful damsels, sumptuous feasts and a host of colorful characters, all backed with stunning sound effects. You can bet up to 5 coins on each of the 9 paylines, taking the maximum wager per spin to 45 coins, and as usual only max bets qualify for the serious progressive jackpot which happens when 5 King Cashalots line up on the 9th payline. Adding to the excitement are Wild Multiplier and Scatter symbols coupled with a humorous theme that ensures you will be thoroughly entertained. The Jester is the scatter symbol, through which wins calculated on the total number of credits staked are added to payline wins. King Cashalot is the symbol to watch for however, because being a Wild Multiplier he will double your money, when completing a valid winning combination. He substitutes for all symbols except Scatters and the Treasure Bonus symbol. The bonus feature is particularly rewarding, and is triggered by the King’s pet Golden Dragon. Scattered on reels 2, 3 and 4, when hit this mythical creature opens the royal vault, where generous King Cashalot himself offers the player 3 chances to keep or pick again from 8 bulging Treasure Chests. This is the first progressive video slot with a 0.05 credit denomination. Once awarded, this progressive re-sets to 100 000 credits - even the second highest jackpot on the game is 75 000 coins at max bet. King Cashalot is powered by the elegant, state-of-the-art Viper software platform, which remains a revolutionary industry leader two years after its introduction by Microgaming. Now well accepted by the online gambling community, Viper empowers the player with a host of optional assists, features and analytical information to enhance the gambling experience. No other software on the market offers as wide a range of facilities. The largest King Cashalot progressive jackpot was won by Tim F. who has hit $1,218,306.82 on September 14, 2005 at Jackpot City online casino. Another winner - Karen K - hit a whopping $946,886.05 at 7 Sultans online casino on February 21, 2008. See all King Cashalot winners stories here.